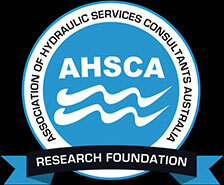 The Association of Hydraulic Services Consultants Australia (AHSCA) is a not-for-profit, professional organisation of consultants engaged in the design, documentation and inspection of hydraulic, plumbing and fire protection systems, within the building and construction industry. The AHSCA is committed to the development and advancement of Hydraulic Services Engineering. The Association provides an opportunity for the exchange of information, the latest product data and regulatory requirements. AHSCA recognises that the current standard referenced in the Building Code of Australia, (AS/NZS 3500.3) has significant limitations that have hampered the broader construction industry for some time. These restrictions severely limit the design options that can be considered when designing roof drainage systems for large buildings. As part of its responsibility and commitment to its members, the AHSCA has decided to commission a comprehensive research study to develop accurate performance and design guidelines for roof drainage systems. The University of the Sunshine Coast (USC) and its research partners offer a team that has both the experience and capability to provide the outcomes described in this proposal. USC and its research partners have been leaders in education and research into innovative technologies for commercial and industrial developments, and have won several state and national awards. The Research Facility will develop advanced roof drainage solutions that will be able to be utilised both locally and internationally for high rainfall events. Current best practise has relied on an extrapolation of low flow data from out-dated research that has been found to have inherent limitations. The outcomes expected would be particularly applicable to any large roof catchment such as shopping centres, airports or any large development and also be particularly suitable for tropical areas that are susceptible to sudden and sustained rainfall events. It is envisaged the frequency of building flooding will be dramatically reduced and the outcomes are expected to provide the engineering protocols to accommodate changing rainfall patterns. It is believed that the test rig constructed at the facility is the largest of its type and one of the very few in the world that can observe the hydraulic behaviour of all the difference components of a roof drainage network operating in synchronicity. Preliminary (non-official and un-calibrated) testing has already far exceeded the maximum permissible flow rates used throughout Australia and New Zealand as set out in Australian / New Zealand Standard 3500.3. This research project is a joint initiative between USC and AHSCA to undertake a comprehensive investigation into the performance and capacities of gravity roof drainage systems and to develop a comprehensive sizing procedure for roof drainage systems incorporating internal box gutters, overflows and downpipes. The outcomes from the proposed research project have the potential to significantly expand the flexibility and options for the design and construction of roof drainage systems both in Australia and internationally. It is expected that the research will also lead to cost savings for property owners whilst providing the broader community with further benefits that include increased protection against flood damage caused by over topping of box gutter installations. It is intended that the outcomes that stem from this important research will assist those building professionals involved in the design and construction of roofs and roof drainage systems. The current regulatory framework throughout Australia permits performance based design solutions. It is envisaged that the research will be utilised by design professionals as a reference for performance based design submissions to authorities, local councils regulators and certifiers. The inclusion of Performance Based design incorporated into Australia’s National Construction Code provides the platform for industry and research bodies such at the USC to work in concert to develop solutions to bring to the building industry. The Performance Based initiatives of Australia’s modern regulatory framework provide an environment where industry is not stifled or limited by regulatory oversight and bureaucracy, thus encouraging innovation such as that being developed at the research facility. Summary of experimental procedures, methods and initial study results. A Summary (max. 4 pages) suitable for publication and public release. The project outcomes could also potentially lead to the development of new specialist training courses for industry professionals as previously described.